Ten years prior to the turn of the 18th century there were only two diplomatic missions, one in London and one in Paris--and 10 consular posts. By 1800 the number of early diplomatic missions had tripled. By 1900 there were 41 diplomatic missions and 318 consular posts. It was in 1924 that the two Foreign Service systems were finally merged. 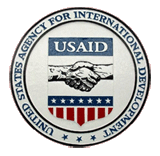 As of the year 2000 there were some 250 posts abroad, staffed by Foreign Service officers and specialists representing four United States government agencies  the Department of State, the Agency for International Development, the Foreign Agricultural Service, and the Foreign Commercial Service. And of course the Central Intelligence agency and military contingents attached to each mission. Run Dates(s)/ Time(s): 46-06-07 to 46-10-25; NBC; Twenty-one, 30-minute programs; Fridays, 11:30 p.m.
We invite you to compare our fully provenanced research with the Tales of the Foreign Service log from the '1,500 expert researchers' at the OTRR. 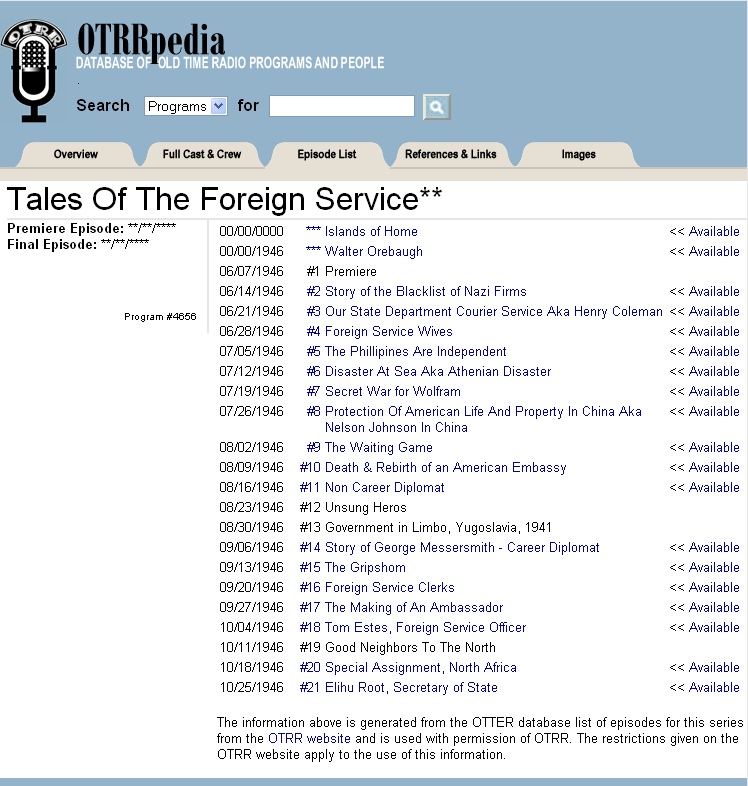 Quite simply, the OTRR's Tales of the Foreign Service log is a work of utter fiction. We've also provided a screen shot of their current log for comparison, HERE, to protect our own further due diligence. As the self-styled 'most authoritative and accurate vintage Radio authority in the world' one might have expected the OTRR to have at least attempted an explanation of their utter absence of verifiable provenances, dates, titles and episode order. 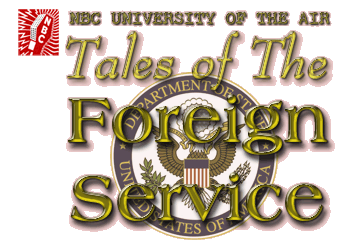 Tales of the Foreign Service, a dramatized broadcast to run 27 weeks on NBC. Through the co-operation of the State Department, the scripts are to be based on incidents revealed in files heretofore classified as secret. They are to cover activities from Washington's time to the present. While the opening date is not until June 7, preliminary work on the program is already underway. Incidents taken from the files of the U.S. diplomatic corps will be incorporated into a 27 week dramatic series called "Tales of the Foreign Service" and will begin on NBC June 7. 11:30-12--Tales of the Foreign Service: Wilms Herbert, Narrator WEAF (Premiere). 11:30-12--Tales of the Foreign Service: "Story of the Blacklist of Nazi Firms" WEAF. 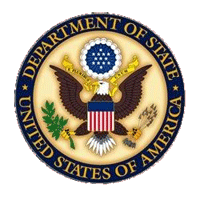 11:30-12--Tales of the Foreign Service: "Our State Department Courier Service"--WEAF. 11:30-12--Tales of the Foreign Service: "Foreign Service Wives"--WEAF. 11:30-12--Tales of the Foreign Service: "The Philippines Are Independent"--WEAF. 11:30-12-Tales of the Foreign Service: "Disaster at Sea"--WEAF. 11:30-12--Tales of the Foreign Service: "The War for Wolfram"--WEAF. 11:30-12--Tales of the Foreign Service: "Protection of American Life and Property in China"--WEAF. 11:30-12-Tales of the Foreign Service: "Death and Rebirth of an American Embassy"-WEAF. Mrs. J. Borden Harriman's adventures as one of the few women diplomats in State Department service, will be dramatized in "Non-Career Diplomat" on "Tales of the Foreign Service" on NBC at 10:30 Friday night. 11:30-12--Tales of the Foreign Service: "Non-Career Diplomat"--WEAF. 11:30-12-Tales of the Foreign Service: "Unsung Heroes"-WEAF. 11:30-12-Tales of the Foreign Service': "Government in Limbo-Yugoslavia, 1941"-WEAF. 11:30-WEAF--Tales of The Foreign Service: "The Story of George Messersmith"
11:30-12--Tales of Foreign Service: "The Gripsholm"--WEAF. 11:30-WEAFTales of the Foreign Service: "Foreign Service Clerks"
11:30-12--Tales of the Foreign Service: "Making an Ambassador"--WEAF. Tales of the Foreign Service on NBC at 10:30 is to do "The Making of an Ambassador." 11:30-12--Tales of Foreign Service: "Officer Thomas Estes"--WEAF. 11:30-12--Tales of the Foreign Service: "Good Neighbors to the North," John Holtman, Narrator--WEAF. 11:30-12--Tales of the Foreign Service: "Elihu Root"--WEAF.